This early twentieth century commercial building in the heart of downtown Florence is known as the Waters Building, as it was built in 1914 for Washington M. Waters. Waters came to Florence from North Carolina in 1878 and began working at a local furniture store. Before long, Waters bought his own furniture business, which came with a funeral home. At the time, these two types of companies were often linked, as caskets came from furniture stores. As Waters’ business grew, he needed a larger space for his endeavors. 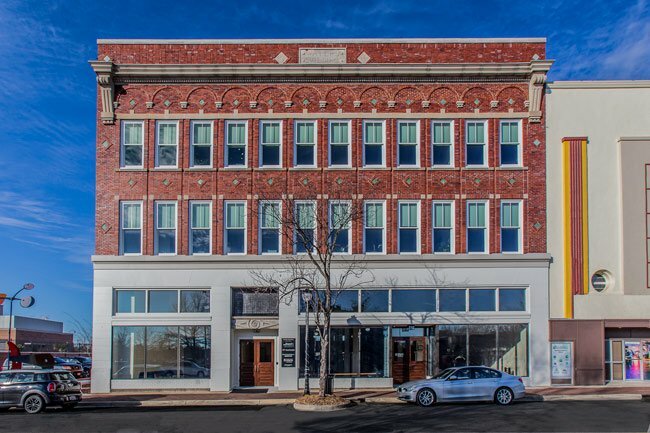 This three-story building was built as a result, housing not just a furniture store and funeral parlor, but also space for his son, Dr. Charles Waters, to practice dentistry. According to local lore, a tunnel was built through the middle of the building to allow horse-drawn hearses to enter and exit. Waters’ store was successful and well-known throughout the region, not just because of his business acumen, but also for his famous sign featuring a moving rocking chair. Waters, who also served as mayor of Florence, died in 1939. The business remained in the family for many years before becoming Kimbrell’s Department Store. In 2012, Key Architecture began making renovations to the storied building; it now serves multiple purposes as office space, gallery space, and an annex of the Florence County Museum. The Florence Downtown Historic District is significant for its association with Florence’s commercial development since the city’s founding, as well as for its examples of commercial architecture dating from the period ca. 1890-ca. 1940. The district reflects the city’s growth as the nucleus of a successful regional railroad network and as a thriving commercial center for the entire Pee Dee region. The Florence Downtown Historic District is a collection of thirty commercial buildings, of which twenty-four are contributing buildings and six are non-contributing buildings. This area contains the majority of the late nineteenth to early twentieth century architecture remaining in the city. Most buildings are two-story brick buildings with embellished cornices. Many are characterized by flat rooflines, decorative brick moldings, and vertical pilasters. While all the properties have been modified to include modern storefronts, the upper facades are largely intact and retain their integrity. These contributing resources are from a time during which Florence enjoyed tremendous growth and prosperity and reflect the development of the city from ca. 1890 to ca. 1940.